When I reflect on the questions I have received over the years and continue to receive about managing the home landscape, one of the common themes is timing. When should we fertilize, prune, plant, cut back, harvest, etc? So here are a few important “timing” answers. The best time to prune most plants is when they are dormant in the early or late winter. Before trees leaf out, you can see the branch structure and decide which limbs to remove and which to save. When pruning to thin out a tree, it is important to maintain the natural shape by carefully selecting tall, outlying branches for removal. When you prune during dormancy the trees stored resources are still in the roots and large stems. After pruning, trees can concentrate those resources in the remaining branches for a good growth flush. If you prune once a plant has started leafing out, the resources have already moved into young branches. The branches you remove will deplete the tree’s resources. You need to know if a shrub flowers on new wood or old wood, before you prune. For most spring-blooming shrubs, it is safe to simply prune after flowering. There will be a new flush of growth and those branches will flower next year. If a shrub only flowers on old wood, you shouldn’t remove too much wood in a summer pruning because there will be little old wood remaining for flowering next year. Don’t prune too late in the season (before dormancy) because that might encourage a flush of growth that won’t have time to harden off before winter temperatures hit. Some shrubs are repeat bloomers. If you prune spirea after flowering, you may get a second flush of flowers. St. John’s wort will rebloom during the summer after pruning. A new lilac named ‘Bloomerang’ is a rebloomer, but you need to trim off the first flowers and prune it lightly to encourage the rebloom. Herbaceous plants, especially fall bloomers, can be pruned (pinched back) once or twice until late June to encourage a dense shrubby habit and better blooming. This is especially true for garden mums and asters. First remember that fertilizer is not plant food. Plants make their own food through photosynthesis, so fertilizer should be thought of more like vitamins (if we are going to anthropomorphize) than food. Nutrients in fertilizer are combined with starches and sugars produced by plants to make proteins that are used in plant growth. If plants don’t have enough starches and sugars, pushing growth by fertilizing can be detrimental to plant health. Turfgrass is the most common component of the home landscape to receive fertilizer. The best time to fertilize the lawn (as I have preached many times) is the fall. Lawn grasses grow roots and tillers in the fall, so that is the type of growth you are promoting rather than top growth, that must be cut. If your lawn is suffering, it may be due to compact soil, low pH, not enough sun, disease, insects or weed competition. Discover the source of the problem and correct it, rather than applying a shot of fertilizer. Fertilizer applied in late spring, can promote disease problems. Cool season turf enters a stressful time of year when temperatures rise and rains slow (or sometimes stop). New succulent growth, pushed by a late spring or early summer fertilizer can be more susceptible to disease. By using a slow release fertilizer, you can put all your fertilizer down in the fall and encourage a deep healthy root system for your lawn. Annuals and vegetable gardens need fertilizer during the summer. These plants are actively growing and producing flowers and fruit (or other plant parts) that we harvest. They pull nutrients out of the soil to support that heavy growth. Once you stop harvesting a vegetable crop, stop fertilizing. We always think of spring as the best time to plant. But, most trees and shrubs grow roots actively in the fall, so fall is also a good planting time. You can even plant all summer, but you need to be more aware of supplying water regularly if we get into a dry spell in the summer. Even if you planted in the spring, trees and shrubs won’t be fully established that first summer and may require supplemental watering. Be a little careful planting small perennials in mid to late fall because they may not have enough time to get their roots established prior to freezing and thawing that occurs all winter and potentially heaves the young roots out of the ground. Plant your new lawn or renovate the lawn by overseeding in the late summer to early fall. The soil will be warm enough for germination, but the evenings are starting to get cooler and promote the growth of our cool season turfgrasses. Also, there are fewer weeds to compete with your young grass plants in the fall. My garden is one big flower shop during the spring, summer and fall. I hardly ever have to buy flowers for the table once my plants start to bloom. Consider including good foliage plants for flower arrangements as well. Japanese solomon’s seal (Polygonum odoratum ‘Variegatum’) is a favorite, with a nice clean variegated leaf that lasts and looks great in arrangements. Arkansas bluestar (Amsonia hubrichtii) is a great ferny texture in a vase. Get cut stems in water quickly, especially on hot days. Recut stems before arranging them in a vase or flower arrangement. 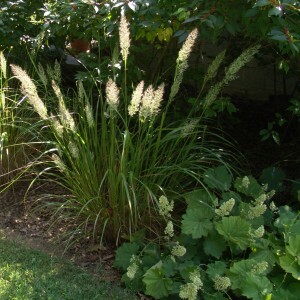 These Korean feather grass (Calamagrostis brachytricha) and alumroot (Heuchera macrorhiza) flowers make great, long-lasting, greenish white cut flowers. They should start blooming a bit later in the summer. If you are establishing new perennial fruit or vegetable beds such as strawberries or asparagus, refrain from harvesting the first year after planting. With asparagus, you can harvest for about one week the second year, two weeks the third, three weeks the fourth and so on. A fully established asparagus bed can be harvested for 6 weeks. Then allow the shoots to form the ferny fronds for the rest of the year. If you want to learn more about what is happening in the garden and when to do things, follow me on Instagram at SBARTONHORT.